This cute box was hand-crafted by master artisans. The box is made by spin-casting a metal-alloy in the shape of a frog. 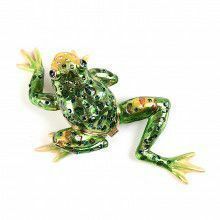 The frog is the plated with 24-carat gold. After that the frog is given a handful of Austrian crystals to wear on it's back. The Austrian crystals are meticulously hand-placed. This box features a swirling yellow enamel interior. The frog box opens and closes easily thanks to a magnetic clasp. Not only does this box open easily, but it closes firmly as well. Great for a gift, or a piece of decoration for your home or office. Ribbit!